The idea of creating Aging Outreach Services and a company based upon caring for older adults with an emphasis on quality of care and quality of life began 18 years ago. The spark was ignited simply by my love and admiration of my great grandmother, Winifred Medley. She lived in Illinois when I was growing up. We frequently spent summers and holidays visiting family in the area. Initially, she was widowed but still lived in her own home. Visits to her house were a treat. She made chocolate pudding for my sister and me, and we rummaged through her attic treasures. She and I shared June birthdays, so we often celebrated together. Eventually, my great grandmother moved to a nursing home. I would visit her whenever I could and send her letters and cards encouraging her to stay active. Now, I wish I could find those letters. I would love to see what my advice was. I recall thinking that there had to be a better way for people to age, and I knew from that young age, I wanted to help find it. When I graduated from Oklahoma State University with my masters in gerontology, I found that very few people were familiar with the term. Related jobs typically required a degree in social work, so that the government requirements for reimbursement or licensure would be met. I started gaining experience working in long-term care facilities and quickly learned that services provided to residents were greatly dictated by regulations, funding sources and reimbursement rates but not necessarily what the individual needed or wanted. I knew then that consumer-directed care was the direction I wanted to go in my career. 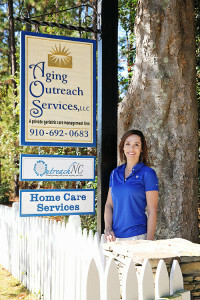 Aging Outreach Services was established in 1999. The first line of service and core of the business, was marketing myself as a geriatric care manager. I joined the National Association of Professional Geriatric Care Managers and became certified. I began providing care management services to clients and families needing help with care, placement, medical appointments, coming up with a plan, identifying resources and much more. It was very rewarding and the care and services I provided were customized to what each client wanted and needed. One of the first needs I identified as a gap was the ability to help clients find dependable, private-duty caregivers whom they could utilize for help with household tasks, cooking meals, transportation or personal care. Many times, a spouse is overwhelmed with trying to care for an aging spouse, and their adult children live out of the area and cannot provide the necessary assistance. These clients needed someone to call for the various things that need to be addressed as a person ages and faces disabilities and changes to mental and physical functioning. Aging Outreach Services continues to grow. From my house, to a garage office, to a small cottage I converted to an office, to our current office in downtown Southern Pines, we continue to provide care to clients across south central North Carolina. Every client experience has confirmed that I made the right choice. The ones that are easier to navigate and go according to plan affirm my choices and skills. The ones that are challenging—sometimes heartbreaking—teach me and make me a stronger advocate for those I serve. The individuality of each client and situation is what makes being a care manager a unique experience. Early on, I worked with a lady who was determined to stay in her home and do things her way. With each challenge and set back her ability to manage the most basic daily tasks lessened, she became bitter and angry at the world. It was not always easy to go see her every week, and it certainly did not seem rewarding at the time. At times, she slammed the door on me or called me names, but I knew it was fear speaking and loss consuming her. I continued to go each week and check on her, sort the mail, forward the bills, communicate with her family and physicians, make sure her medications were being taken correctly, and that she had food to eat and someone to stay with her at night. Eventually the routine provided her with comfort, and when physical and mental abilities continued to decline, I became the one comfort and support she knew would be there for her. Toward the end of her days, when communication had ceased, I could see the look of love and appreciation in her eyes, and I knew the journey to get there had been worth it. I knew without a doubt that the care and quality of life she experienced in her surroundings on her terms was far superior to anything else in any other place she might have been placed. Care Management is about giving older adults and their families options and resources to age the way they choose to and when things fall apart, being there to help pick them back up. Our goal is to provide compassionate, dependable care to enable older adults to navigate the processes and systems involved in aging successfully. It means empowering others to make decisions in their life for the care they hope to receive. It means giving the client the knowledge and resources to make the decisions and choices that fit their own belief system. Care Management is also about being able to jump in when a crisis occurs and be the voice of action and stability at the same time. Care Managers have to be familiar with all resources in a community as well as changes that can occur mentally, physically, socially and spiritually as a person ages in order to create a plan that encompasses each aspect. As our practice has grown, I have looked for other care managers that care about the individual, are professional and resourceful and work hard, even when the crisis happens on a Saturday. Creative thinking and collaboration are key skills of putting all the pieces together, and when they change or fall apart, doing it all again. Patience, perseverance and passion for older adults are all essential and combined with professional ethics to work in the best interest of each client or family we come in contact with. We may not always have the answer, but we always know where to find it. Elder care is a profession, just like law or finance. You want someone who is educated and continues to get education related to the many aspects involved in navigating aging. Regardless of your circumstance or resources, you want a professional who can help you make the best choices. Many people do not want to think about aging, or of themselves as aging, so they find themselves making decisions in a crisis or without understanding all of the options. 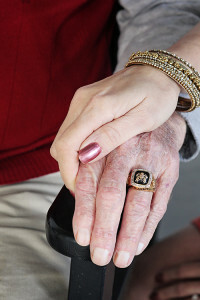 A full-service elder care firm provides experts who step in and help you make these decisions. A great deal of the future of healthcare is going to be privately funded, and whether you have many or few financial and support resources, knowing the best way to utilize them is key. As more and more providers enter the field with promises and creative marketing, the consumer must do their homework and make sure that the people you trust with your most valued resource have the credentials and scope of services to not only meet, but exceed your needs. As advocates for older adults, it is our mission to ensure they have true quality of life. This passion is what drives all of the services that AOS provides. It is extremely rewarding to help a client with small daily needs as well as life-changing decisions—in routine and in crisis. Our services are designed to be individualized to client needs and to provide a professional service with heart.